At 16 years old, after a surgery-gone-bad to help correct her scoliosis, Monica was told that she would never walk again. 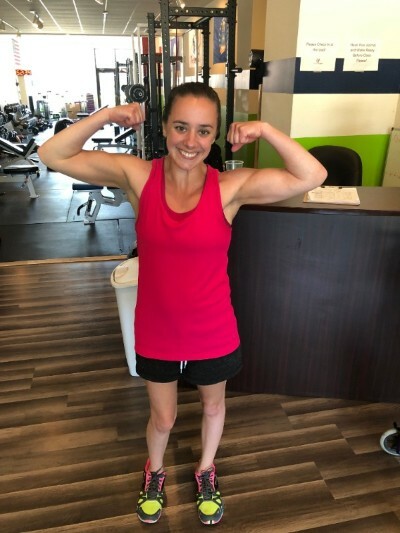 Yet every week, Monica walks through our doors at Hybrid with a contagious smile on her face, and she does what she was told would be impossible. In fact, just yesterday she did a whole lot more than just walk! Laterally walking, stepping over things, stepping up on to platforms… AND stepping backwards off of that same step! We take for granted the awareness we have of where our feet are. When she was stepping backwards off of that step, she really don’t know where her feet were going. She just had to trust herself! When we first started working together, we had to try and figure out parking arrangements. In our main entrance, there are only steps… so that made it difficult. On our back entrance, however, there is a ramp that leads up to the sidewalk where the door is… but the ramp is on the OTHER side of the block. From there she made it a goal to be able to walk the whole distance of the block… and shes already done that over and over. When we were walking the block yesterday, we got stopped by a few tourists, and they decided they wanted to have a full blown conversation! They were really nice people…But standing still for Monica is exhausting. So as we spoke, in the corner of my eye I could see her gritting her teeth trying to stand straight up. We decided from now on it would be a good addition to her workout routine to find random strangers on the sidewalk and talk to them. I can’t express how inspired by her and how far she has come. But even beyond that… she just has the biggest heart and is so courageous. Even if she didn’t make any progress at all, she is an amazing person that we can all learn from. Every time she comes in… even if I’m having a crappy day, my day immediately takes a turn for the better. Thank you Monica for being you, being so strong, and not letting anything get in your way! Monica hasn’t let her injury stop her in any other areas of her life either! She is married and has a beautiful baby boy, and is a guidance counselor at a local school! Keep doing your thing Monica!! !